It’s more than six years now since the Seacoast jazz community said goodbye to Paul Verrette, but his legacy remains. Paul is remembered as an excellent jazz pianist, an educator, a mentor, as a founder of the Seacoast Jazz Society and longtime president of the organization. Paul was a local product, born and raised in Dover and educated at the University of New Hampshire. He earned a Master’s degree in Musicology at Boston University and went on to join the music department at UNH, where he was Associate Professor Emeritus of music. Many of us knew Paul best as a jazz man, as a real student of jazz. But in fact, he was classically trained and only later fell in love with jazz. Never forsaking his first love, though, Paul lived his musical life in the two houses of classical music and jazz. Described as a terrific classical pianist who knew how to swing when he was on a jazz bandstand—something not all classical musicians can pull off—he was equally knowledgeable about the jazz tradition and classical music. 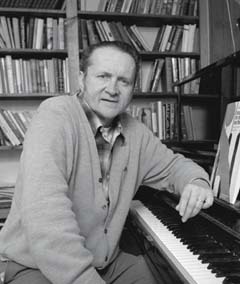 Paul was a practicing musician for 60 years, performing with big bands during the ‘40s and ‘50s and regularly with faculty jazz groups at UNH. Seacoast jazz fans remember him at The Metro in Portsmouth (now Rudi’s), where he played every week for many years in a duo with the late bassist Jim Howe. The UNH community remembers him teaching in their music department for 33 years (1962-1995) and then performing as a liaison to the University’s Library of Traditional Jazz and working closely with its benefactor, Dorothy Prescott. We’re all grateful to Paul for helping to bring, along with retired Director of Jazz Studies David Seiler, the Traditional Jazz Series to UNH. Over the years, Paul hosted Monday night series concerts and wrote the program notes for over 200 of them. In the process, he established friendships, and often played, with some of the jazz world’s greatest luminaries, such as Clark Terry, Doc Cheatham and Milt Hinton. Paul Verrette was one of the Seacoast’s most influential and most beloved jazz educators and musicians. He is missed.